Secrets of Master Hypnotists, Mentalists & Controllers Revealed! Get Instant Access to Some of My Best Training ABSOLUTELY FREE! Who Else Wants to Take Advantage of This Super Discount on My Best Selling Manuals? These Are Sold on Amazon Every Day for $30.36 Each. These manuals sell every day at Amazon, Barnes & Noble, Borders and other online retailers for around $30 each in hard copy format (Regular Price $39.95 each). 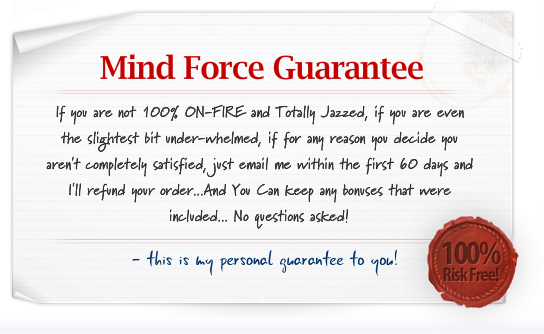 Since you signed up for my “Mind Force Hypnosis Videos & Reports”, I’m going to give you the chance to get your hands on over 300 pages of information for more than 50% off and also throw you some awesome bonus items to boot. Just see on the graphic below all of the additional bonus items you’ll receive when you order this today with this very special “Limited Time Offer”. I will add several “Quick Start” videos and audio files which will allow you to get the maximum out of this material (sold elsewhere for $29.95 each). You get it added to your order today for FREE! You’ll also get a bonus “Hypnosis Secrets Revealed” Manuscript, which is over 70 pages and includes additional information and concepts not discussed elsewhere. The reason we can do this is because we are the publisher of the books, and sometimes we will have more books printed than expected and since we get a price break on these books, we decide to extend it to our customers. Since I have the extra inventory and I want you to have an opportunity to get a deal that you won’t get anywhere else, I am including my best selling Mind Force Secrets Master System Manual to sweeten the pot! This manual contains (3) of my best manuscripts and sells everyday at online retailers for $30 or more (regular price: $39.95). You’re getting (3) three top shelf training manuals and over 400 pages of training. You’ll learn super effective and esoteric meditation methods in my Mind Portal training, amazing psychic development training (this one is worth the entire cost–very rare instruction) with Internal Power Centers and very unique strategies to utilize the laws of attraction with my Magneto Method manual. Because this is based on a limited amount of inventory, don’t delay as the price could go back up at anytime to the regular price of $79.95 for all 3 manuals (still a discount over purchasing them from Amazon or other online retailers). Why pay top dollar when you can get all of this hard to find information at a fantastic savings and value. Order today, you’ll be glad you did. These Manuals Sell Everyday Online at Amazon for $91.08, Yours Today Only $49.97 + s&h! Unlock high velocity energy transmissions to get someone s attention: Invoke someone to do what you want, when you want. The Mind Force Hypnosis Closed Door Hypnosis Files Manual comes complete with (3) three powerful Hypnosis methods. You’ll learn more in these 3 manuals than most full blown courses, and that’s a promise! Each Manual sells for $19.95 in electronic format, so you are getting a value, when you order the hard copy edition. Totally unique book. Nothing like it on the market. You’ve probably heard about Hypnotic Spirals and Devices, but do you know how to use them? This manuscript will show you in detail how to use these devices for use on yourself or others. When I found this book, I knew There was something special about it. It transformed my skills over night. Here’s a little taste of what you’ll discover. Hetero Hypnosis is the study of how to hypnotize others. Talk about power…Hetero Hypnosis contains insights into every imagninable form of Hypnosis. Included are how to conduct stage hypnosis. Here is just some of what you will learn. Many books which cost twice as much as this or more contain less info than this dynamic study of Self- Hypnosis. Discover Hypnosis Fact or Fiction? Before you can effectively hypnotize others, it’s very helpful to learn how to hypnotize yourself first. In this video and audio, you’ll learn the most important parts about Self-Hypnosis, Auto-Suggestions, and other cool methods to get yourself into a quick and effective trance like state. This manuscript covers a lot of concepts not covered in any of the other manuals. It also provides interesting tests, techniques and strategies on how to get hypnosis to work in a variety of ways. The 12 Devices Manual is one of the hard copy manuscripts contained in the Mind Force Hypnosis Manuel. This audio file will explain the nuances of how these amazing hypnotic charts work. MP3 File Allows You to Drop This Right Onto Your IPod or Computer. All of the Digital Downloads including PDF Files, Videos and MP3s. I realize that I will be receiving (3) hard copy manuals in the mail and that it could take 2-4 weeks to receive them. I also agree that this is the biggest no brainer when it comes to high quality Hypnosis instruction.